Great Smoky Mountains National Park is a photographer's playground at all times of the year, but especially so in the Spring. Nature's rebirth in the Smokies begins with blooming redbuds and dogwoods and continues with an explosion of approximately 1,500 flowering herbs, shrubs and trees. Rivers and streams are at or near their high-water mark and varied weather conditions allow the chance for capturing the many moods of the Smoky Mountains. Redbud trees begin blooming in early-to-mid April and phenomenal displays can be found along Little River Road. Concentrate on this flowering tree having placement in your images that create visual impact and tension. Pay special attention to your images foreground or background if the main subject of your photograph is the Redbud tree. Long exposures with a background of a softly flowing stream or gentle cascade may be exactly the image you wish to capture. Closely following the Rebud bloom is the bloom of the Dogwood tree. The large white flowers on this tree can be exactly what is needed to add visual interest to many landscapes, such as rivers, landscapes and cabins in the area. Wonderful displays of this flowering tree can be found within most areas of the park. Some of my favorite locations when photographing this subject include Cades Cove, Tremont, Little River Road and the Noah "Bud" Ogle Place along Roaring Fork Motor Nature Trail just outside Gatlinburg, TN. Cades Cove is the most visited area of the park. The best times to photograph this area is during the "magic hours." That is, one hour after sunrise and one hour prior to sunset. Primitive cabins, churches and grist mills along the loop road make for pleasing and appealing architecture photography. Be sure to add the occasional redbud and dogwood blooms to give your image appeal. Landscapes, panoramas and vistas abound in Cades Cove. Wildlife is abundant and commonly seen as well as photographed. While in the area be sure to go on one of the short hikes and learn a little about the history of Cades Cove. 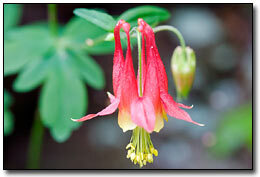 The best area I've found for wildflower photography is within the first mile of Abrams Falls trail. 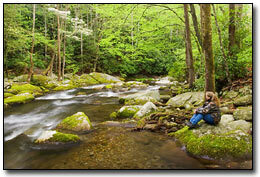 The Tremont area of the Smokies is less than 1 mile from the Townsend "Y". Just off the main road, this area is often forgotten by tourists in favor of the trip to Cades Cove. This area is one of my favorites to photograph in the Smokies. The main attraction of this area is Middle Prong of Little River. It's miles of cascades and gentle falls can keep a photographer occupied all day. Concentrate on this area during overcast days, especially if a light or intermittent rain is falling. 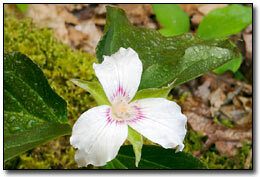 The area also harbors flowers such as the Crested Dwarf Iris and Showy Orchis. If you visit the area, be sure to continue on the gravel road past Tremont Institute. Little River Road is a wonderful area to begin a day's photography, beginning with first light. Nearly everywhere you look, stream and waterfall images abound along this 17-mile road. This road can easily occupy a photographer from sunrise to sunset if the light is right. An abundance of flowers are found along this road, ranging from Fire Pink and various Trilliums to the delicate Columbine. Meigs Falls and The Sinks are viewable from the roadside. Laurel Falls is a short, easy, paved 1.3 mile hike to one of the most visited waterfalls in the park. The best conditions for photography along Little River Road is an overcast day with little or no breeze. Use caution on and along this road, as it is heavily travelled.